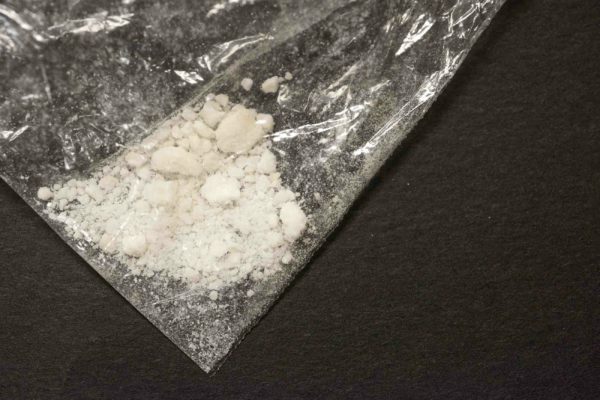 A small bag of straight Fentanyl on display at the state crime lab at the Ohio Attorney General's headquarters in London, Ohio. In 24 of the nation’s largest cities and the counties that surround them, fentanyl-related overdose deaths increased nearly 600 percent from 2014 to 2016, according to county health departments nationwide. According to overdose records in those cities reviewed by The Washington Post, there were 582 fatal overdoses linked to fentanyl in 2014, a number that soared to 3,946last year. Officials estimate there will be a much higher number of fatal fentanyl-related overdoses in 2017. Cook County, Illinois, (Chicago) recorded a 2,700 percent increase in fatal fentanyl-related overdoses, jumping from 20 in 2014 to 562 in 2016. Orange County, Florida, (Orlando) saw its 34 fatal fentanyl overdoses in 2014 triple to 105 in 2016. And Franklin County, Ohio, (Columbus) went from 13 such overdoses two years ago to 111 in 2016. The spike in fatal fentanyl overdoses in greater Philadelphia has been among the steepest. In 2012, the drug was linked to nine fatal overdoses, according to the health department. By 2014, that number had grown to 100 fentanyl-linked overdoses. Pennsylvania law enforcement officials just announced last year’s totals: Fentanyl was responsible for more than 400 overdose deaths in Philadelphia last year and more than 2,000 fatal overdoses statewide — marking the first time in recent state history that heroin was not the most deadly overdose drug. Officials note that in some places medical examiners did not test overdose victims for fentanyl — which does not show up on all standard drug screenings — until 2015, probably causing an undercount in its lethality until then. But they say the raw number of fentanyl-related deaths last year was staggering. President Donald Trump on Thursday agreed, saying that the opioid crisis is a national emergency, pledging more money and attention to the problem. As users developed tolerances for the heroin, dealers in search of something cheaper and even stronger began mixing in illicit fentanyl — a synthetic drug that in its legal form is sometimes used in anesthesia to prevent surgical pain. Soon, even as overdoses spiked, countless drug abusers sought out the more powerful fentanyl-laced heroin, and thousands of users became hooked on the more potent drug. Miami’s fentanyl problem came into stark view in July, when authorities released preliminary toxicology results showing that 10-year-old Alton Banks died in June from a combination of heroin and fentanyl. The state attorney there raised the possibility that Alton came into contact with the drugs at a community pool or on his walk home through a neighborhood known to be an illicit drug marketplace. Because contact with fentanyl could be deadly, some police departmentssend doctors with police on raids so they can treat officers who encounter drugs. An officer in East Liverpool, Ohio, said he accidentally overdosed in May after a traffic stop when he used his hand to brush powdered fentanyl off his uniform. While many of those overdosing on fentanyl specifically aimed to use the drug, health providers and police officials say many overdoses occur among users who did not know the powerful opioid had been cut into heroin — or even their cocaine. Amber Snyder, 29, recalls a change in her father’s behavior during the last months of his life. Ray Snyder’s speech was slow and slurred, he wanted to sleep all day, his memory was shaky. Her father had been a substance abuser for as long as she could remember: alcohol, crack cocaine, heroin. But something this time was different. A hospital in New Haven, Connecticut, treated 12 overdoses, three of them fatal, in just an eight-hour period in June 2016 among people who thought they were using cocaine they purchased on the city’s streets. The white powder turned out to be fentanyl. Overdose records in Philadelphia show that at least 162 people died there last year from a combination of fentanyl and cocaine, one such death almost every other day. In New York, which recorded more than 600 fentanyl-related fatal overdoses last year, at least 115 of the deaths were due to cocaine and fentanyl combinations. The illicit fentanyl often is imported directly from Chinese sources by mail or comes from Mexico, where the synthetic drug is manufactured using chemical compounds, experts and authorities said. Dealers then mix the powder into other drugs, making for imprecise potency in sometimes-lethal doses. In Cleveland’s Cuyahoga County, the medical examiner has raised concerns about overdose trends, blaming fentanyl-laced cocaine for a doubling of African-American fentanyl deaths in the county last year. Cocaine users often aren’t aware they could encounter a dangerous opioid when they use. “I just said I was scared for her and didn’t want to see her going down the same path I went down,” said Tavasci, 45, who works in recovery services after his own battle with substance use. Just a month later his daughter was begging him for help, and he got her into a rehabilitation center. It didn’t work. Six months later, on July 22, 2016, Emma was pronounced dead, her autopsy citing a cocktail of substances including cocaine, chemical traces of marijuana, two prescription drugs and fentanyl. In Philadelphia, there are an estimated 70,000 heroin users, according to a mayoral task force working to combat the opioid epidemic. As fentanyl kills more drug users, the number of people seeking training on how to use naloxone, an overdose-reversing drug sold under the name Narcan, has increased, according to Elvis Rosado, who facilitates trainings in Kensington. Many want to use Narcan as a lifeline, knowing they might need it when they get high. Some give away a little product as an enticement, but the samples come with a deadly catch, Gutierrez said. One bag out of the batch usually contains a lethal dose of fentanyl. If word of an overdose from the lethal bag spreads, drug users seek out the dealer – because they know that dealer has the strongest product, the best fix for the money.